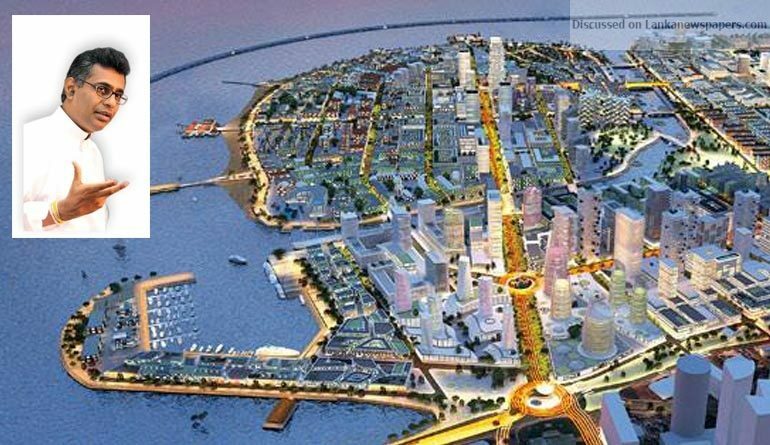 Work on the International Financial Centre of Sri Lanka that will kick start operations in the Colombo Port City will commence in June this year, Megapolis and Western Development Minister Patali Champika Ranawaka said yesterday. He further said that the China Harbour Engineering Company has agreed to invest USD 1 billion towards the completion of the International Financial Centre of Sri Lanka, which is a sixty storied three tower building complex. Addressing a press conference at the ministry auditorium at Suhurupaya, Battaramulla, Minister Ranawaka said the feasibility study and a comprehensive environmental impact assessment and a social impact assessment have already been comlpeted. He added that President Maithripala Sirisena will declare that the land reclaimed for the Colombo Port City is a part of Sri Lanka in March this year and Gazette same. “Later on the land would be handed over to the Urban Development Authority and the latter would lease same to China Harbour Engineering Company for 99 years,” Minister Ranawaka said. He said that fresh legislation is being prepared by a team from the Prime Minister’s Office, with the help of international experts, headed by our former Attorney General Yuwanjan Wanasundara Wijethilake for the administration of this newly reclaimed area so as to convert it to an International Finance centre. It will be presented to Parliament and passed the Parliament in April or May. “We will invite all the financial institutions and individuals and other entrepreneurs to invest their money in our financial center,” Minister Ranawaka said. He further said that green transport would be given priority and then public transport, while the use of personal vehicles will come later. He added that 60 hectares would be owned by the government while 110 hectares will be leased to China and another 90 hectares allocated for the public. He added that the area that was earmarked for a formula track by the previous government will be used to construct a public park. He added that currently studies are underway to identify the plants that should be grown in this piece of territory and the organic fertilizer that is to be used would be produced from the garbage in Colombo itself. Minister Ranawaka said that 60 percent of the 269 hectares of terrotiry earmarked for reclamation and the breakwater construction to protect the reclaimed area has been completed. According to the present programme they expect to complete the reclamation and the construction of the Breakwater by June 2019. He also said that the the elevated Airport highway will be connected to the Colombo Harbour extending the Chaithya road and the same to the Marine Drive in Kollupitiya. The Minister added that they have issued strcit instructions to the company that the connection should not disturb the view from the Old Parliament building, and not disturb the use of Galle Face Green by the public and should not obstruct the present view of the ocean from the Galle Face Hotel which is listed as a heritage building. He also added due to this reason the road connection would be an underground one. Minister Ranawaka further said that 46 percent of the last year’s foreign investments have been brought by his ministry and this took care of 25 percent of development work in the country last year.